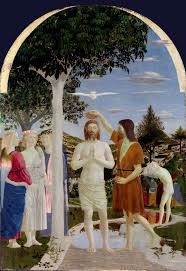 The fruit of Baptism includes forgiveness of original sin and all personal sins, birth into the new life by which we become an adoptive son/daughter of the Father, and member of the Body of Christ the Church. Immersion in water symbolizes not only death and purification, but also regeneration and renewal. Baptism means new birth in the Holy Spirit. It’s not like you coming up and saying, look Father I received this this new model baby. I like him/her very much, but it can give us a little trouble at times. S/he’s still under new baby warranty can you fix the problem? Sorry, but baptism doesn’t work like that! The new birth of baptism, however, will give your child the ability to know God. Later on, what this means is that s/he will be able to define him/herself by seeking goodness, beauty, and truth in the world in which s/he will perceive and know God. Without baptism we are unable to clearly ‘see’ anything good outside of ourselves and we end up defining our self through self-seeking behaviour. The sign and the perfect analogy for baptism is the rainbow which is God’s sign of the covenant (referred to inthe book of Genesis). Through baptism we are drawn to God like we are drawn by the splendour of the rainbow. Both remain elusive, but both are perceptible. This ability to know God is what gives us the ability to be good like Jesus. Hence, we share in His blessing and become, like Him, a priest, a prophet, and a king.